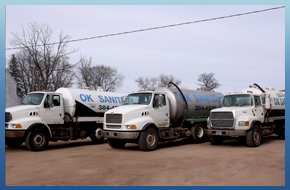 Septic Tank Service Marshfield, WI - OK Sanitary Service Inc. Put your trust in a local business serving Marshfield and the surrounding areas. Serving customers like you since 1986, our team works quickly to help you with everything from answering questions about your system to pumping out full tanks. Maintaining a fleet of 5000 gallon trucks, we are always able to provide you with prompt, same day service, no matter what time it is. A live person answers the phone during regular business hours. Holding and Septic Tanks - Our service is top notch. Commercial Services - Restaurant grease traps, lift stations, and more. With the constant focus on our environment, we have many new guidelines to comply with regarding septage disposal and septic system maintenance. All employees must attend continuing education classes as required by law to be certified and licensed by the Department of Natural Resurces & the Department of Commerce for septic system maintenance.